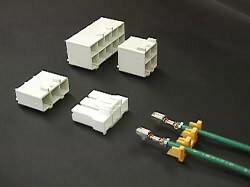 Connectors are used to connect wires for electrical and electronic circuits. When connecting electrical wires using solder or a crimping method and the like, it is necessary to cut those wires to remove them, which makes reconnection difficult. However, using a connector makes it possible to easily and repeatedly attach or detach wires manually or with a simple tool. Due to the superior convenience of connectors, they are always used for electrical machines. connectors for connecting circuit boards. Reliability is essential for these connectors. If a connector product is not properly designed, or quality is not controlled, not only will the product function improperly, but those faults can lead to accidents such as generating heat or causing fires. Today, there is an extremely wide variety of connectors depending on the size, number, and shape of the wires used, or the environment or purpose of its use. Nippon Tanshi designs and manufactures various types and sizes of connectors such as high reliability connectors for vehicle electrical wiring, power connectors for home appliances, signal connectors, water- and dust-proof connectors, and multi-pin connectors. Solderless terminals are one type of connecting components attached to electrical wire ends. This type of terminal enables solder-free connections, as opposed to conventional ones, by applying pressure to the electrical wires and terminals. Nippon Tanshi began manufacturing connectors for vehicles soon after the company was formed, and has kept with the expansion of the vehicle industry. We have a proven track record for vehicle connectors of all sizes, ranging from 0.64 type (025) - 6.3 type (250) connectors used on the harnesses that criss-cross through the inside of a vehicle to the latest, ultra-small 0.5 type (020) connectors and large-sized connectors for EV/HEV. 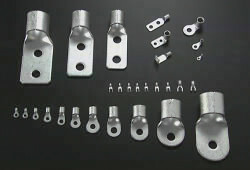 Nippon Tanshi is also actively pursuing the development of new products such as two-piece structure terminals integral-molded by pressing-forming different metals, and connectors of high value due to press-forming, insert-forming, or fabricating with Inconel which is known as a hard-to-process material. The company also provides customers with comprehensive support using its own various testing equipment for the performance and durability tests demanded of terminals and connectors used in vehicles. Nippon Tanshi continues to be a supplier of high quality vehicle connectors through its experience over the years and its continued daily research. Die design with an emphasis on maintainability based on our Quality First philosophy based on many years of experience accumulated in the vehicle technology and home appliance fields. Die design that is versatile and inventive with new die structures and processing methods for better quality, combined with an understanding of impeccability and innovation. Integration of the three main essential elements - die design, manufacturing and adjusting - achieving delivery of products of ever higher quality at lower costs and with shorter lead-times, while maintaining the ability to manufacture products with high added value. Reducing environmental impact by designing and manufacturing more eco-friendly dies through optimization by adopting new manufacturing methods, die structures, and materials. Dies are the main tools to form terminals, which are Nippon Tanshi's main products. With press-forming, it is possible to reliably form metals of uniform thickness. Particularly, press-forming using progressive dies is one of the most productive processing methods, which makes it possible to set up several dozens of processes for the same die and to feed materials with one stroke to the next process, achieving high precision and high speed. Because progressive dies have a complex structure, they require a high level of designing skill. Nippon Tanshi has made this press die technology its core technology and continued their research on an ongoing basis. In recent years, materials superior in mechanical properties, heat resistance, and environmental resistance are increasingly used due to the improvement in performance of vehicles and electronic devices and the growing call for environmental and energy efficiency. While these materials possess superior characteristics, conversely they also are known for being difficult to press-form into terminal shapes. Nippon Tanshi has continuously studied these difficult-to-process materials from every direction, including research into die materials, surface treatment, and tribology. These efforts have resulted in the establishment of innovative processing technologies. 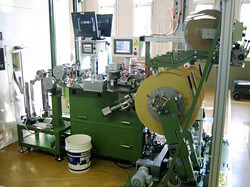 A winder refers to a machine that rolls up stamped components onto a reel. This machine makes it possible to replace reels without having to stop the pressing machine and plays an important role in maintaining high operating rates. Nippon Tanshi designs and manufactures winders itself and pursues higher operating rates using a better combination of winders and pressing machines and backed by the company's technology developed over years. Shape Inspectors, devices which are positioned between the pressing machines and winders, are Nippon Tanshi's original online product inspection system. There are laser and camera types to cover products of various shapes which make it possible to guarantee the quality of each product of each type. When an error occurs on a stamped product, this device instantly stops the pressing machine and winder to prevent erroneous products from moving any further downstream. By linking pressing machines, winders, and shape inspectors, Nippon Tanshi has built a high-quality comprehensive online manufacturing system. This is equipment for manufacturing connectors that achieves high quality and high takt time by automated material feeding, terminal inserting, and inspection. Nippon Tanshi internally develops various assembly machines to fit various product shapes, and saves manpower through automation, contributing to lower costs. The connectors manufactured by these assembly machines are used in vehicles and home appliances. Copyright 2010-2011 All Rights Reserved Nippon Tanshi Co., Ltd.